Christian theologians have admitted for a long time—despite the anguish of church folks who believe in ‘the gospel truth’—that many Bible stories, always assumed to be history, really aren’t. “Well, you can’t take that literally,” we’re told; farfetched stories are re-categorized as metaphor or symbol, and we’re assured that they convey “deep spiritual truth” —even when they don’t all. But we can admire the ingenuity, although we do wonder if they don’t have better things to do with their time. But this is a minefield: When you scrap one story, another that you don’t want to scrap falls apart too. I have long argued that this is what happens with the accounts of Jesus’ resurrection and ascension to heaven. We know that Jesus floating up through the clouds to heaven didn’t happen because heaven isn’t up there. So we can be one hundred per cent certain that the body of newly alive Jesus never left the planet…unless he’s in orbit to this day? Well, how awkward: he must have died again, and was buried again. We don’t need science to show the silliness of all this, i.e., bodies don’t come back to life. The various gospel accounts are a botched job, and once ascension has been ruled out, the resurrection and its theology are left in free fall. Gee, it was just temporary: Jesus didn’t walk out of the tomb to live forever. Maybe, for a while, he got to hang out with Lazarus, who must have been disappointed as well that his rescue from the tomb had an expiration date. The gospels were written in Greek, which is a tipoff that the authors were educated and knew their Greek literature. When the gospels are studied with this background in mind, we can see what was going on. Richard C. Miller, in his book, Resurrection and Reception in Early Christianity, takes us on that adventure. It’s so easy for pastors, priests and lay people to peruse the gospels without realizing the hard work required to see the stories in the original contexts—and what that tells us. That’s an inherent danger in reading an ancient text that supposedly—according to church teaching—is “the word of God for everyone.” Just pick it up, read it and be guided by it. Sad to say, that's not how it works. “…early Christian literature fundamentally and pervasively relied upon and varied upon the standing cultural-literary conventions of the Hellenistic Orient” (p. 18). Skeptical Christians may naively wonder about the Ascension story, “Did that really happen?” but Miller invites readers to see where the story came from. Yes, it was penned by the gospel writers (see Acts 1 especially), and didn’t they rely on eyewitness accounts? But the better question to ask is, “What was the genre of fable that the authors drew upon? Fable is not too harsh, because we know that Jesus didn’t float away. Miller helps us grasp what we’re dealing with. A substantial portion of his book is Chapter 2, “Translation Fables in Hellenistic and Roman Antiquity” (pp. 27 to 82). In this context translation means the transfer of famous (commonly deified) persons to heavenly realms: Famous people got the translation treatment. “The translation fable as a stock epilogical decoration, therefore, developed as an elevated form of hero fabulation embroidering the exalted biography. The culture understood the embellishment as the loftiest protocol in the nomination and canonization of antiquity’s most celebrated iconic figures” (pp. 36-37). And, let it be noted, when the fables included the exaltation of the emperor, it was the custom to provide “eyewitness to the emperor’s ascension to heaven…” (p. 38). In Chapter 2 Miller presents an impressive Gallery of 77 translation fables, citing the literary sources where they can be found. These fables vary in content and details, but we gain an appreciation of the literary genre that influenced early Christian writers as they created their accounts of what happened to Jesus. “The legendary founding king of Rome, while mustering troops on Campus Martius, was caught up to heaven when the clouds suddenly descended and enveloped him. When the clouds had departed, he was seen no more. In the fearsome spectacle, most of his troops fled, but the remaining nobles instructed the people that Romulus had been translated to the gods. An alternate account arose that perhaps the nobles had slain the king and invented the tale to cover up their treachery. Later, however, Julius Proculus stepped forward to testify before all the people that he had been eyewitness to the translated Romulus, having met him traveling on the Via Appia. Romulus, according to the tale, offered his nation a final great commission and again vanished” (p. 63). “Volumes by numerous well-intentioned historians have dealt considerable violence to the Gospel texts, pressing and interrogating them in the hope that an authentic historical Jesus would somehow step forward and present himself” (p. 94). “...the societies behind the early earliest Christian literary traditions appear strangely disinterested in the authentic historical person, Jesus (e.g. , consider Paul’s lack of quotation of or reference to the mundane figure and the absence of historical argumentation throughout the Gospel narratives. )” (p. 94). There has been curiosity about the authors of the gospels, but, Miller notes: “This interest in the Gospels’ authors as the presumed loci of textual meaning, however, proves all the more useless when the best academic attempts at identifying such authors have proven futile. One simply does not know wrote them” (p. 96). He speaks as well of how gospel studies have suffered precisely because the texts are assumed to be “sacred”—and thus, so it is assumed, aren’t tainted by association with other ancient literature; thereby “…relegating supreme interpretive powers into the hands of elite theological institutions, thus ensuring and governing the hegemony of Western ecclesiastical power” (p. 99). A major clue as to what we’re dealing with, in the broad field of Jesus studies, can be found in one of Miller’s footnotes, Number 82, on page 145. 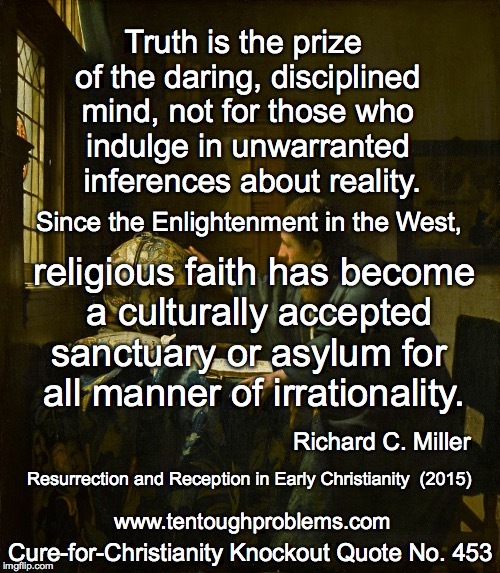 He quotes from Burton Mack’s book, The Christian Myth: Origins, Logic, and Legacy. Miller cites the important work of Lord Raglan, published in 1936, The Hero: A Study in Tradition, Myth and Drama: “[He] succeeded in identifying a recurring pattern in ‘hero’ narratives across times in civilizations, in this case not merely limited to distinctive ‘birth narrative’ motifs. In this significant work, Raglan set out a cluster of twenty-two features that constitute the ‘hero’ pattern…” (p. 104). Raglan proposed a long list of heroic figures who qualified, and Miller points out that another folklorist, Alan Dundes, added Jesus to the list. Jesus has a pretty high ranking, i.e., seventeen of the twenty-two features. The gospel writers were following literary precedent. On pp. 108-109 Miller includes a list of more than sixty kings, queens and other heroes who had gods as fathers, with mortal women as mothers. We can see that, indeed, there is a rich tapestry of fable that provides the background for the gospels: “This same measure of complexity came to characterize the heterogeneity of the Gospel traditions, distinctly Christian amalgams of Hellenistic, Roman, Oriental, and specifically early Jewish cultural forms” (p. 119). And here’s something we can file under Most Unnoticed Facts about the birth narrative in Matthew. Scholars have long conceded that Matthew and Luke invented the Jesus birth stories, but Miller points out (see pp. 122-129) that Matthew was imitating tales of Alexander the Great. The latter “…provided precedence for Matthew’s account, offering an additional cue for the reader, casting the protagonist as Alexander’s mimetic successor. Matthew’s Parthian sorcerers [i.e., The Wise Men], moreover, helped to expand the religio-cultural appeal of the praise-sung hero, thus reflecting the broadening program of Matthew’s community in the Levant” (p. 126). The gospels “…exclude the requisite signals distinguishing ancient works of historiography, that is, no visible weighing of sources, no apology for the all-too-common occurrence of the supernatural, no endeavor to distinguish such accounts and conventions from analogous fictive narratives in classical literature (including the frequent mimetic use of Homer, Euripides, and other canonized fictions of classical antiquity), no transparent sense of authorship (or even readership) or origin, the ecclesiastical distinction endeavored by Irenaeus of Lyons et alli to segregate and signify some such works as canonical, reliable histories appears wholly political and arbitrary” (p. 133). Indeed, the canon is such a jumble because the process of selection of books was “wholly political and arbitrary”—and no amount of posturing about “guidance by the holy spirit” can disguise that fact. One of the highlights of Miller’s Chapter 4, “Translation Fables and the Gospels” (150-184) is his discussion of the “abrupt” ending of Mark that prompted later writers to add more. But maybe Mark’s ending is exactly what the original author intended. “…the most primitive account, Mark, provided in one powerful, singular gesture, namely, a missing body, an unmistakable semiotic conclusion to the narrative: Jesus had vanished; his body had been translated” (p. 165). Miller cites a Greek novel, Chaereas and Callirhoe: “Here, Chaereas arrives at his beloved Callirhoe’s tomb at dawn, only to discover the tomb to be empty. With florid elaboration, Chaereas quite unpretentiously interprets the missing body of his recently interred bride to mean that she had been translated to become a goddess” (p. 165). 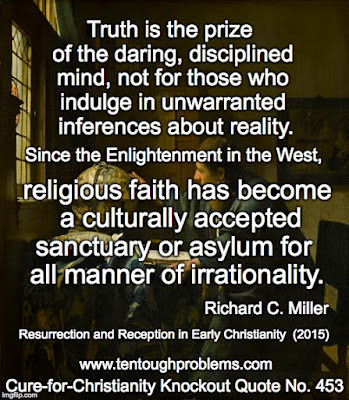 “Belief bias has all too often perverted prior comparative studies between Jesus, the most sacralized figure of Western cultural history, and various images or patterns drawn from ancient society. The deluding will to believe (or to disbelieve) has characterized perhaps most treatments of the historicity of Jesus’ resurrection, resulting in a malignant conflict of interest, that is, projects unduly driven by confirmation bias. Atheistic treatments have often suffered from…whimsical, often contrived associations produced by those (and for those) who seem bent on dismissing such accounts as mere banal product of ancient cultures” (p. 161). “The shock of the Gospels must not then have been the presence of this standard literary trope, but the adaptation of such supreme cultural exultation to an indigent Jewish peasant, an individual otherwise marginal and obscure on the grand stage of classical antiquity” (p. 181). “…the earliest Christians comprehended the resurrection narratives of the New Testament as instances within a larger conventional rubric commonly recognized as fictive in modality. Most modern treatments have mistakenly assumed that these texts alleged to have provided a credible, albeit extraordinary account of an historic miracle…” (p. 181). Miller’s book presents an embarrassment of riches for the serious student, and I have been highly selective in what I have drawn attention to in my comments here. On every page we find an invitation to research and dig more deeply, especially via the abundant footnotes. For those who want to understand the gospels in their ancient context—rather than as random, sanitized verses read in worship services—this book is an important contribution to Jesus studies. We know that die-hard Christian apologists will forever write books to ‘prove’ the resurrection; thanks to Paul especially, their heaven-bound journey depends on it. So the calm, careful scholarship that Miller offers, putting resurrection in perspective, stands as a brilliant corrective. When I was working on my PhD in Biblical Studies at Boston University—in what now seems for me the ancient past!—one of the best aspects of that program was the Directed Study Course. That is, for a semester I met privately with a professor once a week to discuss the assigned readings on the topic we had chosen, e.g., the Book of Deuteronomy or the life of St. Francis of Assisi. Richard Miller’s book, for me, has very much the feel of a Directed Study Course on how the Jesus Epic was brought to a close: a high concentration of scholarship, with abundant detail, based on his awesome command of the literature from which the gospel novelists drew their ideas and inspiration.